Improve families’ sleep quality thanks to hugOne! When sleep goes wrong everything goes wrong… Medical experts agree that sleep quality is one of the three pillars you need to live a healthy life (along with healthy diet and regular exercise). When we sleep poorly, other aspects of our health are affected as well. For instance sleep deprivation could lead to increase stoke risk, or lead to obesity. It could damage bones and lead to memory loss. For children, sleep is even more crucial. It’s what allows proper mind and body development. 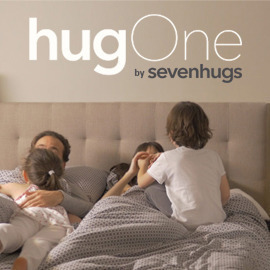 Sevenhugs is a French start-up that strives to reinvent the way families experience technology at home. They have developed a device that works with an app to deliver services and information called hugOne. It’s the world’s first device to combine sleep and environment tracking for the family. It helps the entire family to get better sleep and monitors temperature, humidity and air quality anywhere for a healthier home. We look forward to receiving you entries!